Showers with a possible thunderstorm early, then variable clouds overnight with still a chance of showers. Low 42F. Winds W at 5 to 10 mph. Chance of rain 70%..
Showers with a possible thunderstorm early, then variable clouds overnight with still a chance of showers. Low 42F. Winds W at 5 to 10 mph. Chance of rain 70%. 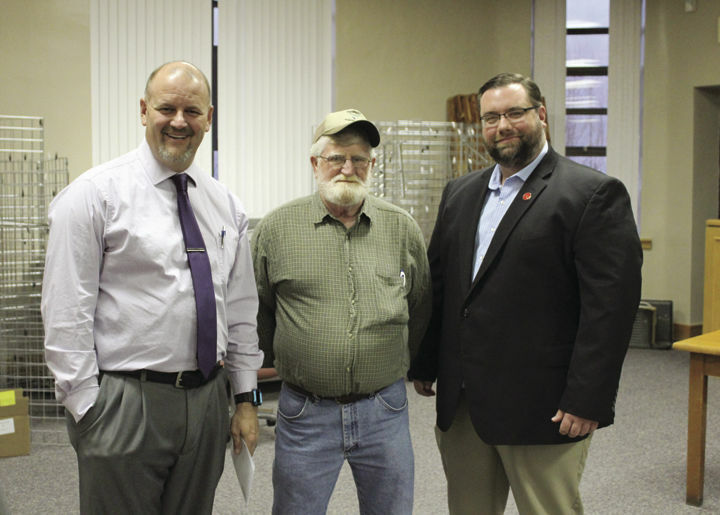 The Kentucky Transportation Cabinet Commissioner for the Department of Rural and Municipal Aid, Gray Tomblyn along with KTC Field Representative Jill Horn Mahler and Mike Caleb, District 11 Engineer attended the regular monthly meeting of the fiscal court on Monday, April 08th, 2019 as part of the KTC’s “Listening” tour. “Who knows better than the local officials what your county road needs may be,” Tomblyn remarked. “Gov. Bevin wants KY to become the industrial manufacturing hub of the United States. We also recognize that roads service people of all political persuasions. Each magistrate here has both Republicans and Democrats that use these roads. “Black”top is “black”! It is not “Red” or “Blue”! Judge Gabbard and the Magistrates have put together a list of projects that they want prioritized and submitted it to the Governor and the KTC hoping to get support to improve our county roads. Mitchell Ball, IDA Director, also spoke with the fiscal court. He informed them that DTS Industries was interested in purchasing Phillips Diversified and bring more jobs into the county. The company has plans to produce products for Hitachi and Toyota at the Annville Indisutrial Park. All local employees would be retained while the company looks to add more jobs to meet their production requirements with perhaps 52 jobs being represented after 3 years. Phillips Diversified had secured a 1 million dollar coal severance loan from the fiscal court a few years back. Ball indicated that Phillips Diversified wishes to pay this loan back to the fiscal court whereupon DTS Industries could then apply for the loan to use for their operations. When the loan is paid back it will bring an additional $500,000 to the fiscal court giving them a final balancxe of $1.5 million. The fiscal court approved the action to receive the payment from Phillips Diversified and then make that money available to DTS Industries as a loan. According to Ball, the IDA is now servicing around 22 loans to help businesses in McKee and the county. In the Sheriff’s report, Sheriff Paul Hays reminded everyone that this is the time of year for Prom and Graduation. “Parents are encouraged to have a talk with their child about safety prior to these events. These are happy times for our children and no one wants that to be interrupted by unnecessary accidents, injuries, or Heaven forbid, a fatality.” Sheriff Hays also wanted to thank Jailer Brian Gabbard and the inmates for their help cleaning up litter from our roadways. He also encouraged residents to take advantage of Free Dump Day coming up on Saturday, April 13th, 2019. Sheriff Hays stated that if anyone was interested in starting a “Community Watch” for their neighborhood his office was available to provide training and help. “When local residents take charge and watch their own neighborhood it makes our job much easier and the the county much safer,” he said. Jailer Brian Gabbard indicated that the jail brought in approximately $98,514 in revenue last month. He indicated that three inmates are trying for their G.E.D. this week. He also indicated that the green house is up and going and the garden is about pick up. The jail also made 8 more new mats last week and continue to repair their old ones as needed with the new sewing machine. 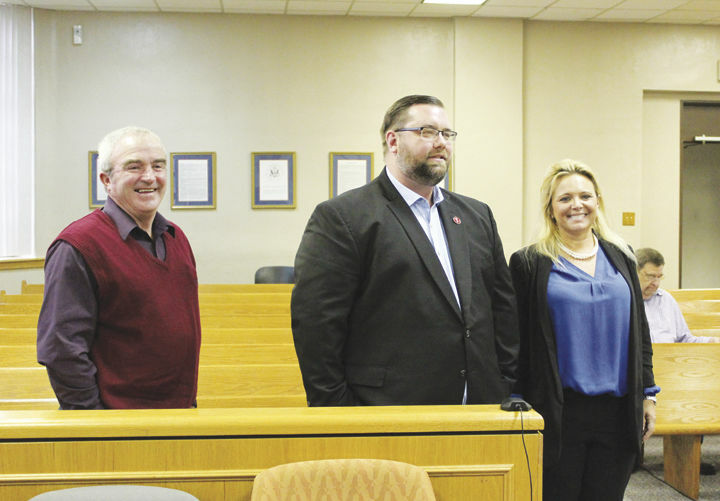 The fiscal court opened bids for blacktop and stone. The only bids received were from the Allen Company and the court approved them. The court approved payment to the roofers that fixed the roof on the Senior Citizen Center. KACo will reimburse for that expense. The court also approved KYEM budget to pay approximately $13,00o toward the salaries of Jamie Strong, EM Director and Amanda Holt. The court conducted the first reading of a Road Fund Budget amendment that would allow them to formally receive approximately $301,875 more into that budget than was initially approved. In addition, they conducted the first reading of a Generals Fund Budget Amendment that would allow them to receive an additional $545,000 for the general fund that would go toward upkeep and improvement of parks and recreation. The court also approved a Land Water Conservation Fund Grant Resolution that would bring in $200,000 to replace lights and create handicap accessibility for Worthington Park in Annville. This is a 50/50 grant which means that the county must provide 50%. However, this could be provided in labor and equipment and PRTC has volunteered to do the work which would satisfy the county’s requirement. The court voted to set the Park rental fee at $40/day based on the recommendation of the Parks and Recreation Board. The county voted to remove C. Wilson Road from the county road system after completing the necessary procedural steps including a public hearing earlier that morning. The court also appointed Tonya Coffey to the Jackson County EMS Board. The court reviewed and approved the Treasurer’s bills and transfers and set the next meeting for Monday, May 13th at 9:00 a.m.
Lady Generals Off to Great Start!